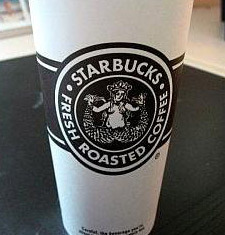 They "might as well call themselves Slutbucks"
A Christian group is horribly scandalized by Starbucks' retro mermaid logo. "The Starbucks logo has a naked woman on it with her legs spread like a prostitute, explains Mark Dice, founder of the group. Need I say more? It's extremely poor taste, and the company might as well call themselves, Slutbucks." Frankly, this new logo is the most exciting thing I've seen at Starbucks since the introduction of the peppermint mocha. You don't think this might be another way for some crackpot religious organization to drum up publicity, do you? Well, we won't fall prey to that by giving it more ink! Oh, wait, never mind.